Saturday September 14th 1889 We had a very hard days work, washed, ironed, put up plums, and tomatoes. I was very tired and went to bed early. I had a letter from Will he don't know just when he will come. Sunday September 15th 1889 We had some baking to do and I was busy about the house most of the forenoon. The folks were over in the afternoon. I called at Mrs Niphers after supper. Will came on the late train last night so we had him with us today. We read in the evening. weather cooler. It was five years tonight since Rob died. Monday September 16th 1889 I went to town with Will early this moring for things for dinner. I put away the fruit and jelly in the pantry. We had put up lately after I cleaned up the house. In the afternoon I gathered plums and tomatoes and put up tomatoes. Mother fixed her plants. Will was fixing up the door locks and I was helping him. I wrote in the evening. Tuesday September 17th 1889 Mother went over to Fannies to spend the day and I worked at the house work all forenoon. Soon as we ate dinner Will and I went to the valley. I got some lard of Aunt Em and we called at Stevens to see the cousin Miss Taylor. Mother was here when we got home and we soon had supper ready. I sewed in the evening Wednesday September 18th 1889 We washed this morning and then Mother and Will started out to see Aunt Sarah who was out at Emmas. They met them coming in and they were here till late in the afternoon. It was a very pleasant day. just such weather as we had five years ago the day Rob was buried. [the following text is written verticallay in the right margin of the above entry and extends into that of Tuesday the 17th] Willie Bremmer came tonight. 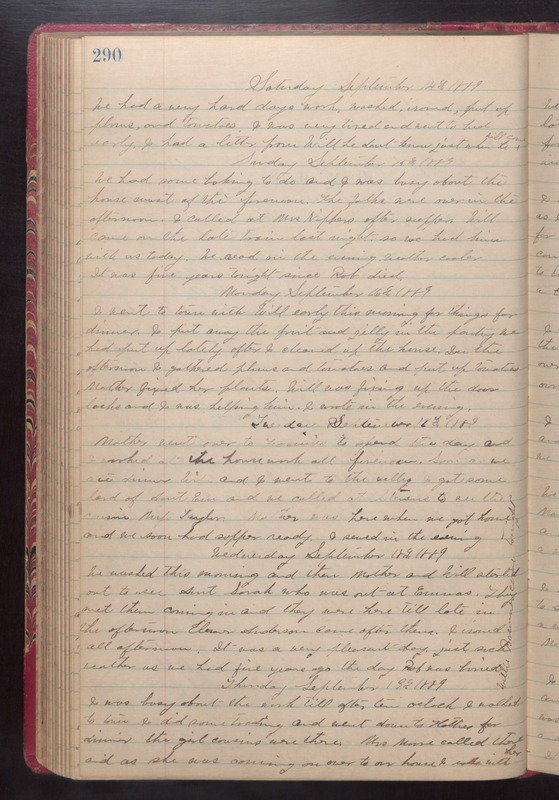 Thursday September 19th 1889 I was busy about the work till after ten oclock I walked to train. I did some trading and went down to Hatties for dinner the girl cousins were there. Mrs Moore called there and as she was coming on over to our house rode with her.